The inner region of an exoplanetary system, where four terrestrial planets orbit a sun-like star. Almost 3,000 astronomers from around the world gathered in Long Beach, Calif., from Jan. 6-10 to discuss the latest space findings at the 221st meeting of the American Astronomical Society (AAS). The conference featured major announcements about some of the biggest mysteries of the cosmos, including dark matter, dark energy, alien planets, and more. SPACE.com's Clara Moskowitz, Miriam Kramer and Tia Ghose provided complete coverage from the 221st AAS meeting, posting updates on Twitter: Clara (@ClaraMoskowitz), Miriam (@mirikramer) and Tia (@tiaghose) and by following the hashtag #AAS221. A possible alien planet discovered by NASA's Kepler space telescope is the most Earth-like world yet detected beyond our solar system, scientists say. Don’t miss these highlights from the “Super Bowl of Astronomy” in January 2013. See the latest photos from discoveries and presentations at the 221st AAS meeting in Long Beach, Calif., this week. After a stellar explosion was reported in 1866, British astronomer John Herschel announced he had seen a bright flare from the same location 24 years earlier. NASA's James Webb Space Telescope is one of the most intricate and powerful observatories ever devised, and it is slowly coming together for its long-awaited mission. Private spaceflight should create many opportunities for scientific progress, though risk will have to be minimized for the field to really take off, a panel of experts stressed earlier this month. Scientists with NASA's planet-hunting Kepler spacecraft have revamped the mission's online archive of alien worlds, opening up the database for the entire world to see. A giant black hole is thought to lurk at the center of the Milky Way, but it has never been directly seen. Now astronomers have predicted what the first pictures of this black hole will look like when taken with technology soon to be available. This crescent-shape image is the best fit to observations of Sgr A*, the supermassive black hole at the center of our galaxy, according to a January 2013 study. A new study of one of the universe's fundamental constants casts doubt on a popular theory of dark energy, scientists say. The Hubble Space Telescope's iconic "Deep Field" photo wowed the world in 1996 by revealing a huge collection of galaxies hiding inside a patch of the sky that looked like nothing more than blank space. Now NASA plans to image six more "empty" bits of sky for a whole new set of deep fields that could revolutionize astronomy once again. A NASA space telescope has captured a movie of a collapsed star that's spinning more than 11 times each second and unleashing ultra-fast particles that move at 70 percent of the speed of light. Astronomers are excited by the possibility of using one of two cast-off spy satellite telescopes gifted to NASA to probe for dark energy. Have Astronomers Found Chemical Precursor to Life In Gas Clouds? Astronomers have found tentative traces of a precursor chemical to the building blocks of life near a star-forming region about 1,000 light-years from Earth. NASA's James Webb Space Telescope — the notoriously over-budget new space observatory slated to launch in 2018 — is on time and still within its new budget, the project's chief said Wednesday (Jan. 9). Astronomers have unveiled a spectacular new photo of cosmic "bullets" slicing through thick gas clouds in famed Orion nebula at supersonic speeds. The title-holder is now NGC 6872, a barred spiral found 212 million light-years away in the southern constellation Pavo, researchers announced today (Jan. 10). Humans have looked up to the night skies and seen thousands of glittering stars since the dawn of time, but streetlights and illuminated signs have increasingly obscured that majestic view. Now astronomers are saying those lights increasingly pose problems for even the most remote telescopes. Space-time is smooth rather than foamy, a new study suggests, scoring a possible victory for the late Albert Einstein over some quantum theorists who came after him. Finding Another Earth: How Will Scientists Confirm It Exists? 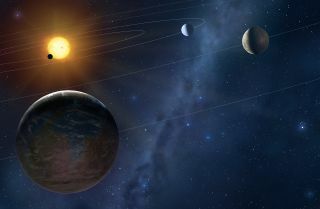 While NASA's planet-hunting Kepler space telescope, which discovered the newfound Earth-like planet candidate KOI 172.2, is great for finding large exoplanets beyond the reaches of our sun, it is not our best bet for recognizing an Earth-twin circling a distant star. The Milky Way galaxy, home of Earth's solar system, may actually be only half as massive as currently thought, scientists say. Astronomers have discovered the most distant supernova of its kind, an ancient and massive star explosion that could shed light on some of the universe's biggest mysteries. Finding Earth 2.0 is just a matter of time, and the discovery will likely transform the way we think about our place in the cosmos, astronomer Natalie Batalha said Tuesday (Jan. 8). NASA's 23-year-old Hubble Space Telescope is still going strong, and agency officials said Tuesday (Jan. 8) they plan to operate it until its instruments finally give out, potentially for another six years at least. Astronomers have discovered a giant asteroid belt circling the bright star Vega, a find that may ultimately reveal an entire solar system of planets, scientists say. The unbalanced orbit of a so-called "zombie planet" in a dusty star system has astronomers struggling to explain the exoplanet's behavior. New observations of the planet Fomalhaut b revealed the oddball orbit, which has wild extremes between its closest and farthest points from the parent star and appears to cross through a vast minefield of dusty debris. Astronomers have mapped out the weird and wild weather of a brown dwarf, a so-called "failed star," in unprecedented detail. A dense atmosphere of hot sand is in the forecast. This image from NASA's Spitzer Space Telescope shows a newly identified "bone" of dust and gas in the Milky Way galaxy's skeleton. The structure, visible toward the bottom of the frame, is about 300 light-years long but just 1 or 2 light-years wide. Astronomers have spotted a new component of the Milky Way galaxy's skeleton — a "bone" of dust and gas that contains about as much material as 100,000 suns. The structure is more than 300 light-years long but just 1 or 2 light-years wide, giving it the appearance of a slender cosmic snake. With fiscal cliffs, debt ceilings and other financial woes facing the country, several iconic telescopes may lose funding and possibly even close. The National Science Foundation faces several years of stagnating or even shrinking funding, even as the bills for major new telescopes come due. The Maya, best known these days for the doomsday they never foretold, may have accurately predicted astronomical phenomena centuries ahead of time, scientists find. A NASA space telescope snapped a new view of two oddball black holes shining ultra-bright in X-ray light in a distant spiral galaxy. NASA’s NuSTAR X-ray observatory spotted the bright black holeswhile observing the galaxy Caldwell 5. A beautiful new image snapped by a NASA spacecraft captures the aftermath of a massive star explosion with unprecedented resolution. The image — taken by NASA's NuSTAR spacecraft (short for Nuclear Spectroscopic Telescope Array) in X-ray light — shows Cassiopeia-A, a supernova remnant located about 11,000 light-years from Earth. This new view of the historical supernova remnant Cassiopeia A, located 11,000 light-years away, was taken by NASA's Nuclear Spectroscopic Telescope Array, or NuSTAR. Image released Jan. 7, 2013. The Milky Way hosts at least 17 billion Earth-size alien planets, and probably many more, a new study reports. NASA's Kepler Space Telescope has detected 461 new potential alien planets, including four worlds slightly larger than Earth that may be capable of supporting life as we know it. Comets may be as common as alien planets in star systems throughout the Milky Way galaxy, scientists say. Astronomers have discovered what appears to be colossal belch from a massive black hole at the heart of a distant galaxy. The outburst was 10 times as bright as the biggest star explosion, scientists say. A new study finds that one of every six stars in our galaxy is home to an Earth-size planet. See how the 17 billion Earth-size planets of the Milky Way galaxy stack up in this SPACE.com infographic. Alien planets born in widely separated two-star systems face a grave danger of being booted into interstellar space, a new study suggests. Nearly 3,000 astronomers will descend upon Long Beach, Calif., next week for the year's largest astronomy conference. Follow SPACE.com for the latest in space science and exploration news on Twitter @Spacedotcom and on Facebook. Twitter users can follow news of the AAS meeting with the hashtag #AAS221.